Exposure of the skin to excessive heat, pollution, dust can cause accumulation of toxic substances that can lead to irritation and other skin problems such as acne, pimples, and dark spots. To maintain their skin health during the day and night time, individuals are spending on a range of personal care products and face washes. Capitalizing on the growing skin requirements of the customers, leading companies are concentrating on offering effective skin care solutions such as night creams. A recent report generated by Transparency Market Research (TMR) states that the global night creams market is expected to reflect a healthy CAGR throughout the forecast period. Night Cream worth more than US$ 10,700 Mn is projected to be sold by the end of 2026. Major manufacturers in the personal care industry are focusing on developing night time skin care solutions that eliminate the toxicity and impurities from the skin. To improve customer experience, companies are offering effective night cream products specific to the requirements of skin conditions and problems for extra dry skin, dry skin, and oily skin. However, manufacturers are utilizing ingredients such as paraben-based preservatives, alcohol, and artificial dyes, which can result in side effects such as skin irritation and rashes. On the account of these factors, sales of night cream product is likely to drop during the assessment period. With the growing age, collagen production and renewal process of the skin slows down, which results in wrinkles, open pores, patchy skin, sagging, and dull skin. In addition, the natural protection barrier and internal support structure of the skin weakens with the growing age. In order to offer effective anti-aging skin solutions, leading manufacturers are focusing on utilizing ingredients such as Aveeno, retinol, and naturally derived botanicals in a range of night cream products. Manufacturers in the personal care industry are broadening their scope of product development in alignment with specific skin requirements such as extra oily skin problems, dry and wrinkled skin, and uneven skin texture. Also, major manufacturers are focusing on utilizing active ingredients such as hyper hydrating hyaluronic acid and retinoid to offer rapid wrinkle repair solutions over the night. As the need for effective skin care. Through developing application-specific products, leading firms are focusing on improving their position in the global market. Throughout the day and while traveling, skin of the individuals is exposed to unwanted pollution, dust, and dirt. Excessive exposure to dust particles can result in toxic accumulation, which can seep into our bloodstream and lead to impurities and excessive sweat. Ignoring skin care requirements can further result in rashes, dermal infections, and skin irritation. To avoid such instances, individuals are increasingly spending on effective skin care solutions such as night creams. Application of night cream eliminates impurities of the skin and prepares it for better reaction to the daytime routines. Manufacturers in the personal care industry are banking on the growing skin care requirements of the customers and developing products for night time damage repair, reducing free radicals, and prolonged moisturizing solutions. As skin of individuals react differently in various temperature conditions, manufacturers are focusing on utilizing effective ingredients such as carnitine and coenzyme Q10 to eliminate dead cells and regenerate the skin. 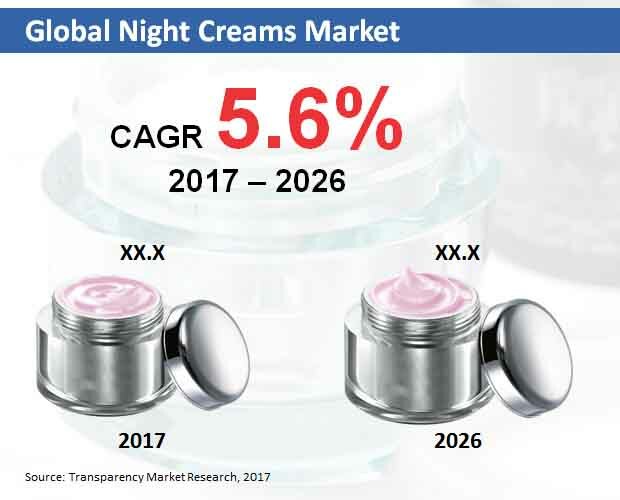 Major companies operating in the global night creams market are focusing on market strategies such as product launches, innovation, and strategic acquisitions. For instance, leading brand, La Prairie has recently launched innovative products such as Rare Cellular Night Elixir Serum for effective moisturizing solutions. In addition, major companies are offering night cream products that offers calming fragrance and comfortable sleeping experience such as Lush sleepy body lotion, Cowshed sleepy cow calming body butter, and Aromatherapy Associates Sleep & Recover collection. Key market players operating in the global night creams market include Shiseido, Lancome, Estee Lauder, Clinique, and L’Oreal.